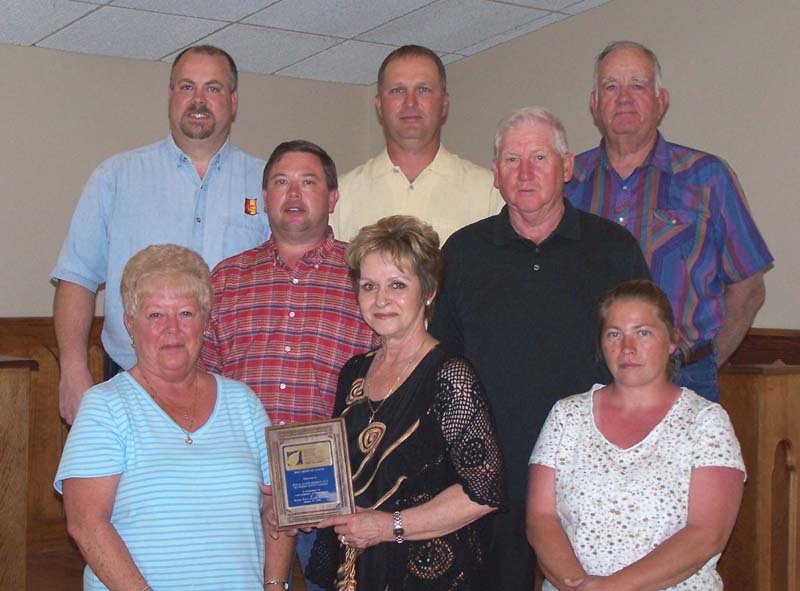 WICHITA, KANSAS—The Kansas Rural Water Association (KRWA) has awarded its 2005 Most Improved Water System Award to Crawford County Rural Water District (RWD) 7. The presentation was made at the Association’s awards ceremony on Wednesday, March 29 during KRWA’s 39th Annual Conference and Exhibition held at the Century II Conference Center in Wichita . The devastating tornado that struck Franklin , Kansas at 5:11 p.m. on May 4, 2003 was a challenge that most water systems will never encounter. Providing clean safe water to the unincorporated community of Franklin founded in 1907 had been originally the job of two separate water companies. In 1997 work began to consolidate the two companies and in 1999 the Crawford County rural Water District 7 incorporated. The District recently replaced 26,400 feet of existing water main and overall maintains 53,000 feet of pipeline with a growth rate of 6% annually. In addition, the water district board is presently working on bringing sewer facilities to the community and a project to provide water service to three new residential developments. In addition to the water project the spirit of the community was actually rebuilt. A Franklin Community Center and Franklin City Park exist today where there were none before. A new sign proudly welcomes people to Franklin as they pull off of highway 69. But one of the most prized accomplishments though, according to Veda Maxwell, bookkeeper for the RWD, is the recent addition of a new storm siren. The remarkable recovery for Franklin , Kansas speaks volumes for the dedication of the volunteers who have worked to save the town and its heritage. Crawford Rural Water District No. 7 is just one part of that effort. The administration and board of directors of the Kansas Rural Water Association recognize that it takes people like the residents of Franklin , and the Crawford RWD 7 Administration and Board of Directors, who are willing to work with people and provide the leadership necessary to capitalize on opportunities for growth that will help sustain our rural Kansas communities. The Kansas Rural Water Association is based in Seneca , Kansas , has more than 775 municipal or rural members and over 280 industry/associate members. The Association provides training and technical assistance to water and wastewater utilities statewide and also supports the popular KAN STEP program through the Kansas Department of Commerce. Left to Right, Bottom row: Cathy McDaniel, Veda Maxwell, Doris Morlock - Center row: Craig Stokes, Ray Hamblin - Top row: Jerry Wayman, Henry Ashbacher, Jim Rhuems. June, 2004: The water district has been very busy working on the infrastructure improvement project. The water district received a grant for $398.000. The water district will be responsible for $48.500 of the grant. The project includes a standpipe that will be 134 ft. in height and 14 ft. in diameter. It will hold 152,670 gallons of water. It will be a back up water supply if the system should go down during a storm or like during the ice storm we had. It will be located on Second and Prospect Street. Henry Ashbacher and Craig Stokes went to De Balk Ill. to look at how standpipes are manufactured. The standpipe will be glass fused to steel tank and maintenance free (no painting). Glass coatings do not require periodic repainting and most graffiti can be removed in matter of minutes. The unique design and bolt assembly of the tank can be pre-engineered to allow for capacity expansion in the future. The cost of the standpipe is $214,000. The district is in the process with final design and the project will go out for bids. Construction will begin at the south end of the district with larger line replacement. Note: Anyone wanting information on any of the Community Boards or Water District Board please submit a written letter of request for the information to the Franklin Community Council, Inc. P.O. Box 43 Franklin Ks. 66735-0043 or RWD #7, P.O. Box 44, Franklin Ks. 66735-0044. Notice: All water payments must be mailed to RWD #7, P.O. BOX 44, Franklin Ks. 66735-0044. Payments will not be accepted at any Water Board members house in the future. If payment is not mailed your water bill will be considered as non-payment and delinquent charges and reconnection charges will apply. No exceptions !! May, 2004: The water district is in the process of evaluating and planning of the reconnection of the waterlines in the Tornado effected areas. These areas have to be tied back into the system. FEMA will cover the cost of this project since it was damage from the tornado. The work has to be completed by Nov. 2004. The district is also finalizing the plans for infrastructure improvements. They will be done with the $350.000 CDBG grant that was awarded last year. The improvements include a 133' tall 14' diameter standpipe. There are two kinds of standpipes, welded and glass lined. Welded has an approximate cost of $135.000 and a glass lined has an approximate cost of $212.000. The glass lined is considered maintenance free and the welded requires paint every 10 years. The cost of painting a welded standpipe is around $35.000. The district will more than likely go with the glass lined as it will be more cost effective in the long term. You can get more information on the glass lined standpipe at (www.aquastore.com). The water district meets every 2nd Sunday of the month at 7:00 PM. Ashbacher Const. building. If you are interested in what is going on please attend the meetings or call Craig Stokes at 620-347-8519.